Sir James Frazer Stirling (April 22nd, 1926 – June 25th, 1992) was a Pritzker Prize winning British Architect and among the most influential architects of the second half of the 20th century. He is perhaps best known as one of a number of young architects in various countries who from the 1950s on questioned and subverted the compositional and theoretical precepts of the first Modern Movement. Stirling's development of an agitated, mannered reinterpretation of those precepts - much influenced by his friend and teacher, the important architectural theorist and urbanist Colin Rowe - introduced an eclectic spirit that allowed him to plunder the whole sweep of architectural history as a source of compositional inspiration, from ancient Rome and the Baroque, to the many manifestations of the modern period, from Frank Lloyd Wright to Alvar Aalto. His success lay in his ability to incorporate these encyclopedaic references subtly, within a strong and muscular, very decisive architecture of strong, confident gestures that aimed to remake urban form. James Stirling's fame is based on the long series of important post-modern buildings. After wartime service, Stirling studied architecture from 1945 until 1950 at the University of Liverpool, where Colin Rowe was his teacher. In 1956 he and James Gowan left their positions as assistants with the firm of Lyons, Israel, and Ellis to set up a practice as Stirling and Gowan. One of the best-known results of this collaboration are the Faculty of Engineering at the University of Leicester (1959–63), noted for its technological and geometric character, marked by the use of three-dimensional drawings based on axonometric projection seen either from above (in a bird's eye view) or below (in a worm's eye view). In 1963 Stirling and Gowan separated; Stirling then set up on his own, taking with him the office assistant Michael Wilford (who provided invaluable administrative help and later became a partner). 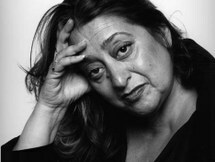 From that point on the design task, which had previously been shared between Stirling and Gowan, remained very much under the control of Stirling, assisted by hand-picked helpers. He completed a training centre for Olivetti in Haslemere, Surrey and housing for the University of St Andrews both of which made prominent use of re-fabricated elements, GRP for Olivetti and pre-cast concrete panels at St Andrews. During the 1970s, Stirling's architectural language began to change as the scale of his projects moved from small and not very profitable to very large, as Stirling's architecture became more overtly neoclassical, though it remained deeply imbued with his powerful revised modernism. This produced a wave of dramatically spare, large-scale urban projects, most notably three important museum projects in Germany (for Düsseldorf, Cologne, and Stuttgart). These projects of the 1970s show him at the zenith of his mature style. 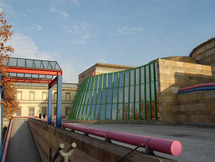 Winning the design competition for the Stuttgart project – the Neue Staatsgalerie – he loaded its powerful basic concept with a large number of architectural amusements and decorative allusions, which led many to see it as an example of postmodernism – a label which then stuck, but which he himself rejected. The last building completed while Stirling was still alive was the bookshop in the gardens of the Venice Biennale (completed 1991). Designed with Thomas Muirhead, this building explored a sparer, more modernist approach. The Venice Bookshop and a number of other late projects were greeted by critics like Kenneth Frampton and others as the possible beginning of a new and potentially important departure in Stirling's work – had he not suddenly died, due to an unfortunate botched minor hospital operation. Although not free of controversy. James Stirling's work has brought him many awards, including the Gold Medal of the Royal Institute of British Architects (1980) and the Pritzker Prize (1981). The cultural depth and richness of Stirling's work attracted the attention of all the major world critics and theoreticians, from Peter Eisenman to Charles Jencks, and the literature examining his architecture is vast. For those seriously interested, the best starting point for further study is the two published books of his complete works, which he oversaw himself, aided by trusted friends and collaborators. These two books chronologically cover every project and emphasise the visual, with thousands of very carefully reproduced photographs, drawings, and models. A number of James Stirling's projects for unbuilt buildings have also been published, partly because of the high quality of James Stirling's presentation drawings. James Stirling has taught throughout his career, both in the UK, foremost at the Regent Street Polytechnic in London and the Cambridge University School of Architecture, and abroad. James Stirling was the Charles Davenport Visiting Professor at Yale University School of Architecture starting in 1967, and from 1977 a Guest professor at the Dusseldorf Kunstakademie.